But if we take a brief look at “Tango Makes Three”, the book really is about two male penguins who hatched an egg that a male-female penguin couple were very happy to let them. I guess you could read it to suggest that a gay couple could adopt and raise a healthy child without hurting anyone. But the authors didn’t just pull this story out of their asses. It did happen, in the New York Central Park Zoo in 1999. “White Swan Express” is pretty much about international adoption. It does feature two married heterosexual couple, one lesbian couple, and a single mother. Last I checked, this reflects reality pretty well - many gay and lesbian couples have raised healthy, happy children, as have single parents. 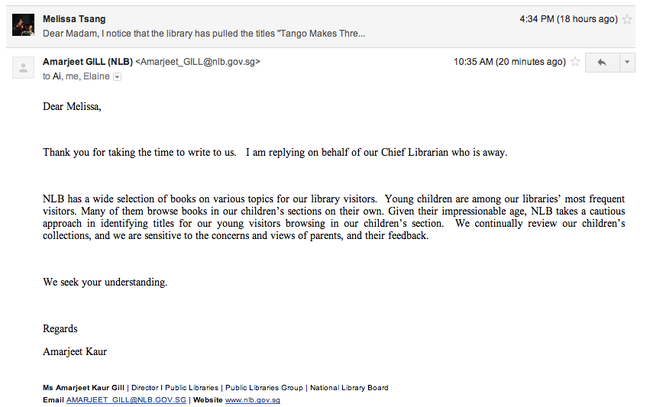 Neither “Tango Makes Three” nor “White Swan Express” are anything short of responsible and educational. Unless, of course, the library believes biology and matters of fact are sacrilege; and that we are doing right by our children by hiding from them the established fact that there are perfectly functional, if unorthodox families. All that aside, it’s only fair that parents decide for their children what they can or cannot read. Surely the library wouldn’t pull a title about an interracial family just because someone feels interracial couples violate “family values”. It wouldn’t pull a title about alternative medicine books that no MOH-qualified doctor will endorse, as well as a variety of books on religion which is an equally, if not more, sensitive topic. The library is a reservoir of knowledge and literature, and it serves the public - its purpose demands diversity in its selection. The fact that “Tango Makes Three”, “White Swan Express”, and related titles, have been in circulation for so long, is evidence that there are many parents who would like their children to know about the existence of a diversity of families. 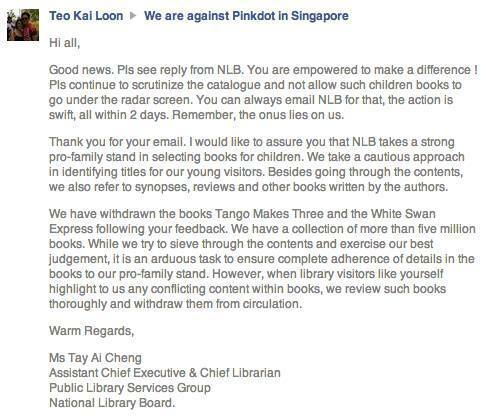 I hope the NLB considers putting these titles back into circulation. Thank you for your time! A very concerned member of the public"